Ever seen Don Broco live? Well if you haven’t, now’s your chance! All of their upcoming live dates are listed below, including venues and ticket details. 18th February Arts Centre Norwich FACEBOOK SOLD OUT! 19th February O2 Academy 2 – UPGRADED! Birmingham FACEBOOK SOLD OUT! 20th February Joiners Southampton FACEBOOK SOLD OUT! 21st February Camden Underworld London FACEBOOK SOLD OUT! 22nd February The Haunt Brighton FACEBOOK SOLD OUT! 23rd February White Rabbit Plymouth FACEBOOK SOLD OUT! 24th February Clwb Ifor Bach Cardiff FACEBOOK SOLD OUT! 26th February Cockpit Leeds FACEBOOK SOLD OUT! 27th February Corporation Sheffield FACEBOOK SOLD OUT! 28th February O2 Academy 2 Newcastle FACEBOOK SOLD OUT! 1st March Cathouse Glasgow FACEBOOK SOLD OUT! 2nd March Academy 2 – UPGRADED! Manchester FACEBOOK SOLD OUT! 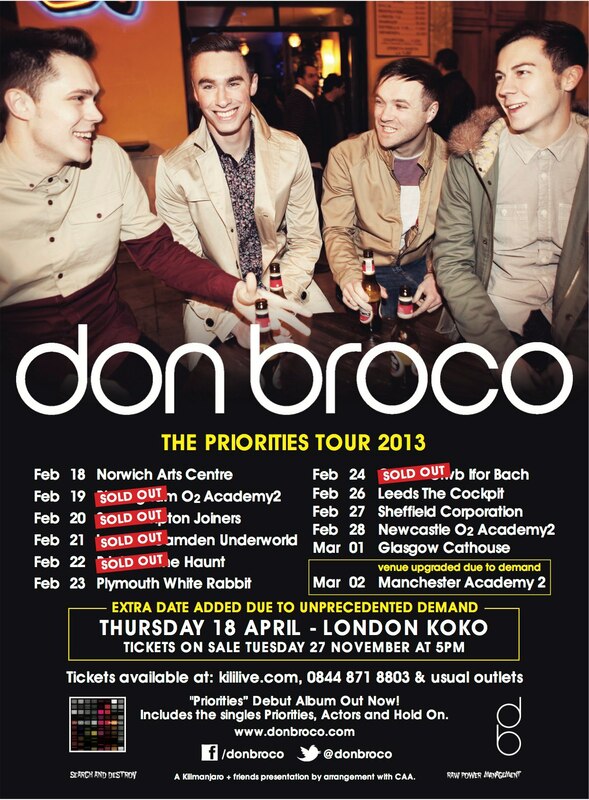 18th April Koko London SOLD OUT!